KRYTAC KRISS VECTOR AEG REVIEW! 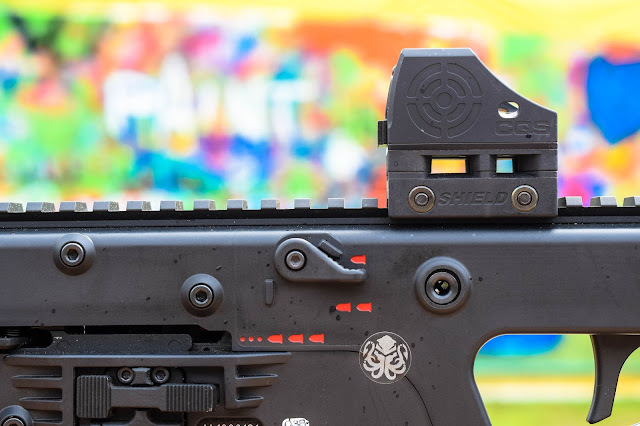 So here is the review you’ve been waiting for, a review of the most highly anticipated airsoft AEG over the last couple of years – the Krytac KRISS Vector AEG! When Pro Airsoft Supplies contacted me about reviewing a highly anticipated AEG I jumped at the chance (having a feeling that it was indeed the Vector) the next thing I know, the Vector was delivered to my door in time for Paintfest 2017/Diamond Wars. I cannot tell you how excited I was to finally get my hands on the final version of this RIF, I’d seen/shot the pre-production model whilst I was in the States but nothing quite prepared me for the excitement of getting to use one – you can check out my reaction in the unboxing video here. So let’s get down to the review and first talk through the externals. 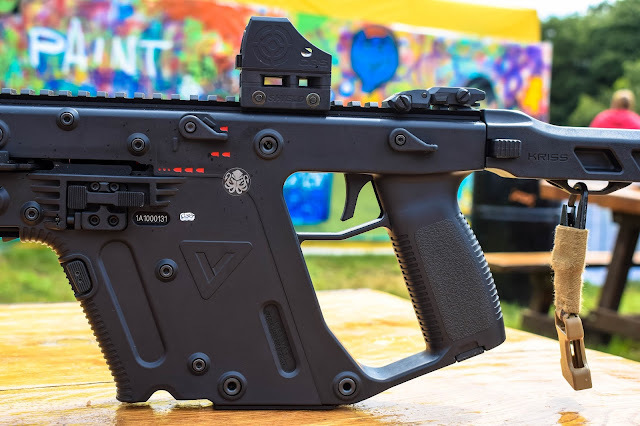 So this is the production model and is identical to the real KRISS Vector, it has a polymer body (that has all the KRISS/Krytac/Vector markings that you would expect to see on its real steel counterpart) with metal pins that are easy to remove, a full length metal top rail suitable for any sights/scopes – on mine I ran the Shield CQS sight. 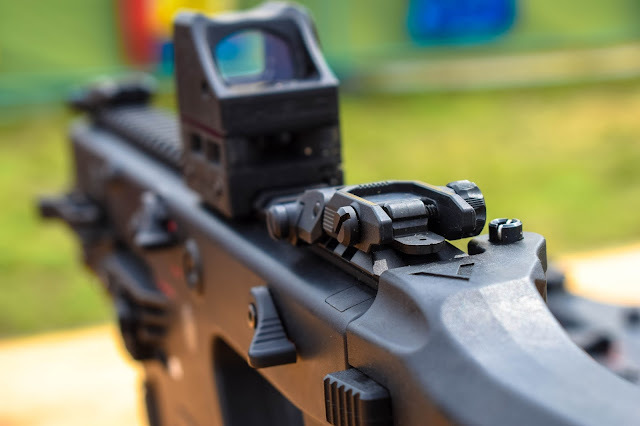 The Vector comes with the Defiance style 14mm CCW flash hider that is found on the Krytac Trident series and the Defiance flip up sights, which have a dual aperture on the rear sight which makes them perfect for long range and CQB shooting. 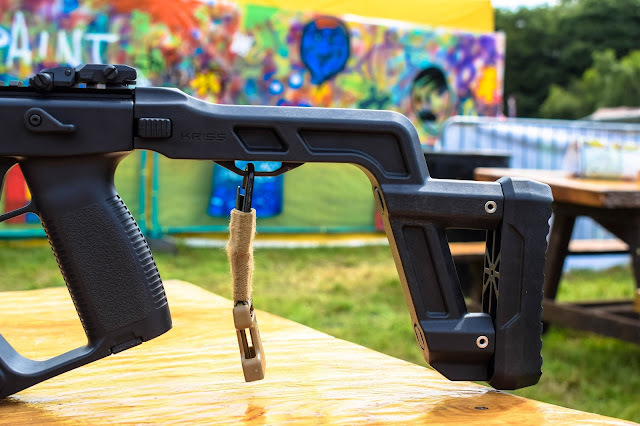 Moving along to the stock we have a reinforced polymer stock with a metal sling point underneath that does fit a whole range of slings, it is worth noting that the buttpad on the stock is adjustable – but only by an inch or so. 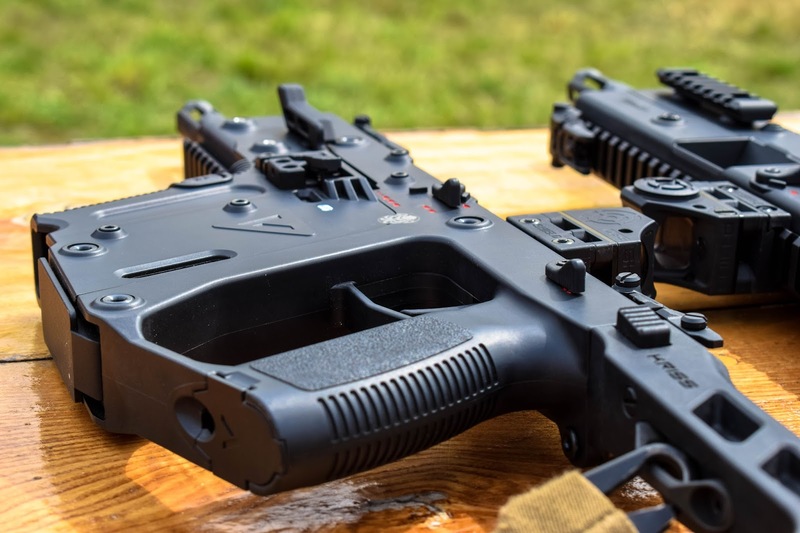 One really cool aspect of the stock is that it folds and locks into place so you can use the vector in its compact form – making it a perfect CQB weapon. It has a metal rail on front which can be swapped to either side via the pins. The bolt release is entirely cosmetic but the functioning bolt opens the hop up chamber – I found that there’s actually no need to use the bolt for this as you can just open the door yourself and it stays open – a feature that I really like, it makes changing the numbered, rotary style hop up super quick and easy. It has semi, two round burst and full auto firing modes on an ambidextrous selector and an ambidextrous safety switch – the safety switch prevents the trigger being pulled and also disconnects the battery and releases the spring to take the stress off the internals when on safe. Moving onto the internals, what are we looking at? We’ll start with the pistol grip where the battery is housed – it has a mini tamiya connection and takes a small stock tube lipo (11.1 1100 mAh 20C Nuprol stock tube lipo is what I ran) The metal plate on the bottom near the pistol grip reveals the spring guide for a quick change spring (no tools are needed). It has a really unique internal build and most of the components are V2 compatible for those who want to upgrade theirs, it is worth noting however that the only two parts internally that are not compatible are the tappet plate and cylinder head. It has a polymer piston of which the first 5 teeth are metal. It also features a polymer cylinder head, an Aluminium mech box, 8mm steel bushings, a similar motor to the motor found in the trident series and an electronic control system that is powered by microswitches - two of which handle the fire selection, one for the trigger and one for the cut off leverage system. Overall a very solid internal build out of the box. Is there anything I think could be improved? Yes. 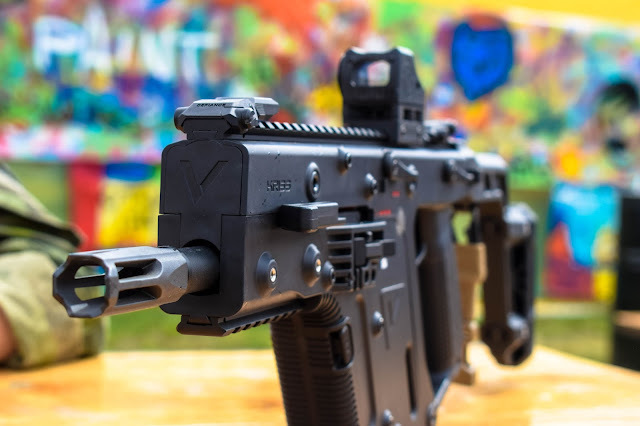 Krytac have spent a long time getting the Vector just right and as close to the real steel counterpart as possible but there are still a couple of things that would make this an even better AEG in my opinion. My first gripe is with the mag release, although it is matched to the position on the real version I feel it is too high up for me personally – as I have tiny hands it’s difficult for me to hold the mag and press the release at the same time, I countered this by pressing the release then catching the mag as it was ejected. 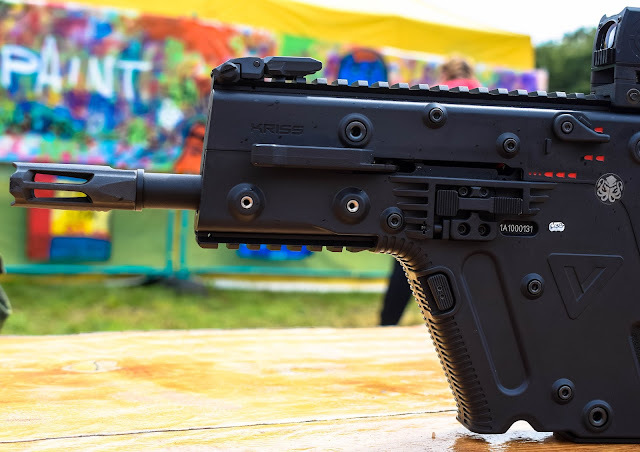 My only other gripe is the sling point, although it fit my sling attachment in with no issues I would prefer it to be in a different location, perhaps on the body? Or on the top side of the stock. Apart from those tiny things, I found it very hard to find anything that I didn’t like about it. 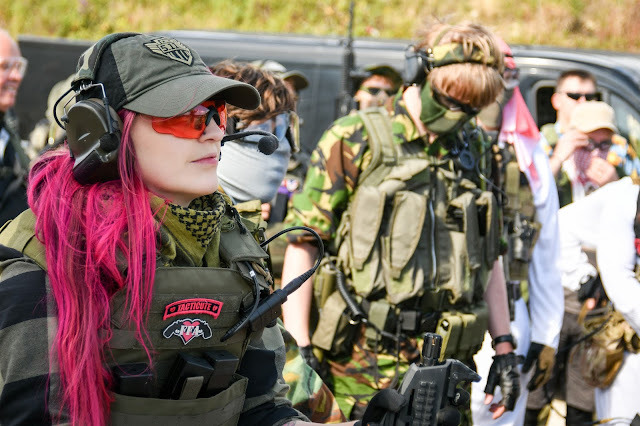 Huge thank you to Pro Airsoft Supplies for letting me run/review this awesome piece of kit. Krytac have done a great job on the Vector, it’s a thumbs up from me! Photography thanks to Henry Nicholson. Another great review Kelly. I've been wanting one of these since the project was announced years ago. Pretty much the same gripes as with the GBB version. 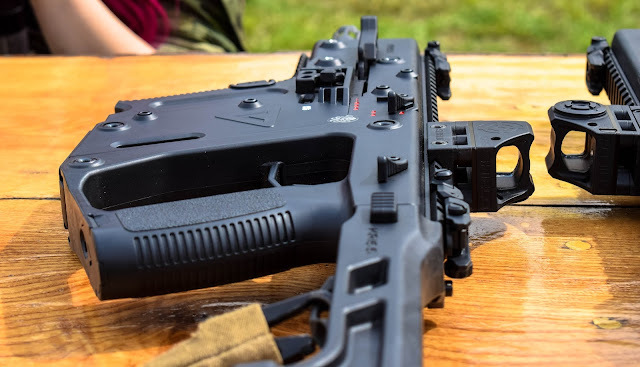 I know that there was an aftermarket mod to the pin holding the folding stock that included a swivel QR/sling attachment point that seemed a bit more natural. My main gripe with the Krytac Vector was the trigger pull, for such a high end gun it's complete garbage! I own a few other Krytac guns and never had a problem with any of the other trigger setups so it seems odd that after all the trouble of making such a good gun they let them selves down in an area they usually excel at. VALKEN ENERGY LIPO CHARGER REVIEW! 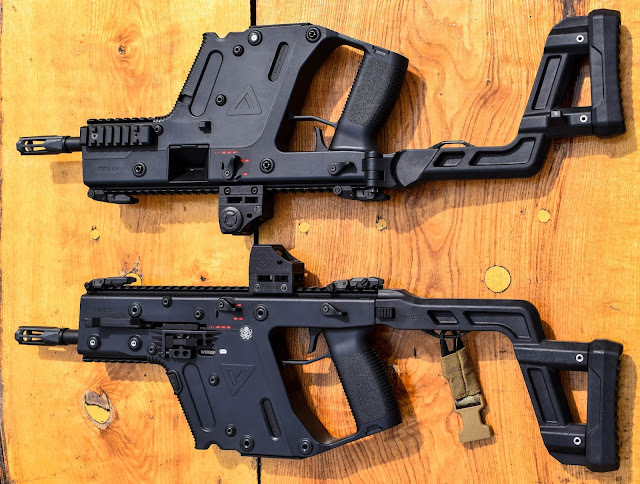 VALKEN BATTLE MACHINE AEG 2.0 TRG-L REVIEW! VALKEN TACTICAL ZULU GOGGLE REVIEW! LEEDS AIRSOFT, THE FOUNDRY CQB REVIEW!